It’s been raining here since yesterday, and apparently it’s supposed to keep raining through Monday. Quite a change from the beautiful sunny weather I was enjoying earlier in the week! My Saturdays are generally low-key – I’ll do my grocery shopping, clean (maybe), hang out with people… just generally veg and enjoy a day of not having to do anything specific. All through this past week, I was trying to figure out what I could make with some leftover lemon juice & zest I had from another recipe. I was initially thinking lemon curd, and then make a cake roll with that as my filling. But then the yolks that I had frozen were a bit rubbery when they thawed – ew! 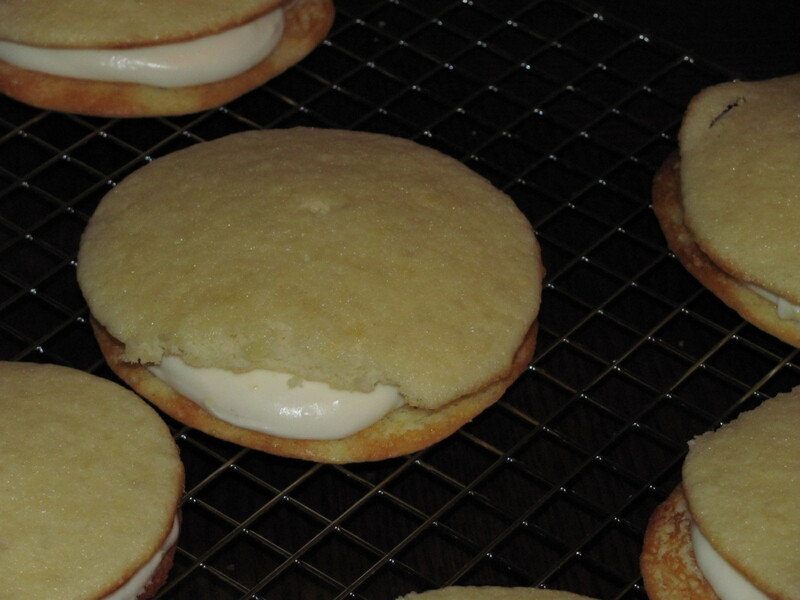 – so I decided to hunt for something else, and found a recipe for Lemon Whoopie Pies. The only whoopie pies I’ve had recently are what you normally think of – two chocolate cakey cookies, with a fluffy buttercream frosting in between, courtesy of my uncle, who started Chococoa Baking Co. a couple of years ago. So I was intrigued by the idea of a lemon cookie with with lemon frosting – it sounded amazing! I make the cookies, went shopping, and sat down to wait for the cream cheese and butter to come to room temperature for the frosting. 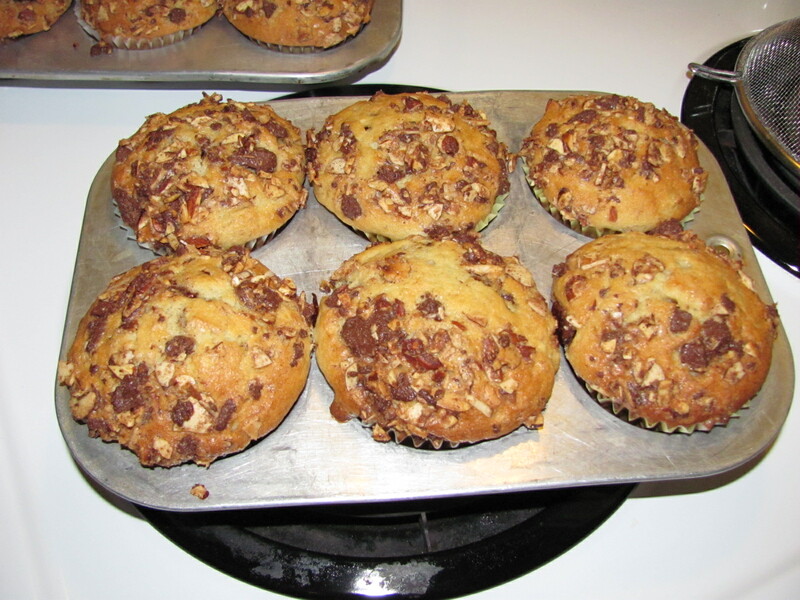 But then I became impatient, so I decided to help them along by sticking them in the microwave for about 10 seconds… and then I made the frosting. It seemed a little softer than it should be (probably because I decided to help the butter & cream cheese soften :)), so I followed Joy the Baker’s advice and put it in the fridge for a little bit. Not all of my cookies were the same size, although I thought I had used the same amount of batter for each one, so while I was waiting for the frosting to harden up a little, I went through and matched them up. Yes, I am just that particular. I dolloped the frosting on half of the cookies, placed the other half on top, and voila! I was going to just let it go at the whoopie pies, and do something more productive with the rest of my afternoon, but I had seen a recipe in a recent issue of Rachael Ray’s magazine for milk chocolate cookies with a peanut butter frosting in the middle that I really wanted to make – the recipe claimed to taste like a Reese’s peanut butter cup. Who can resist that?? So I got everything set for recipe #2. Preheat the oven to 350°. Line 2 cookie sheets with parchment paper. 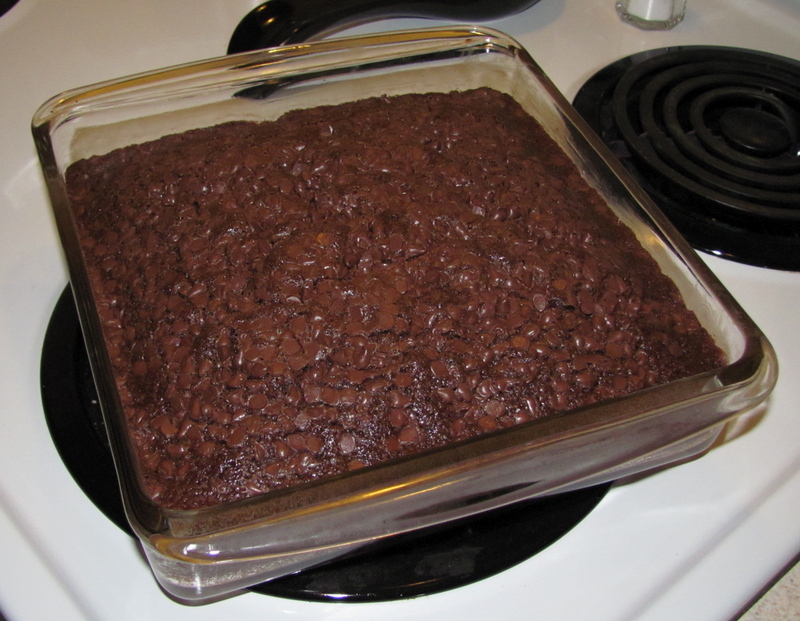 In a medium, microwavable bowl, melt together 2 cups chocolate chips and 2 tablespoons butter on medium power until almost melted, about 1 1/2 minutes; stir just until smooth. In a medium bowl, beat together the remaining 2 tablespoons butter and the peanut butter. Sift in the confectioners’ sugar and the remaining 1/4 teaspoon salt; beat until fluffy. 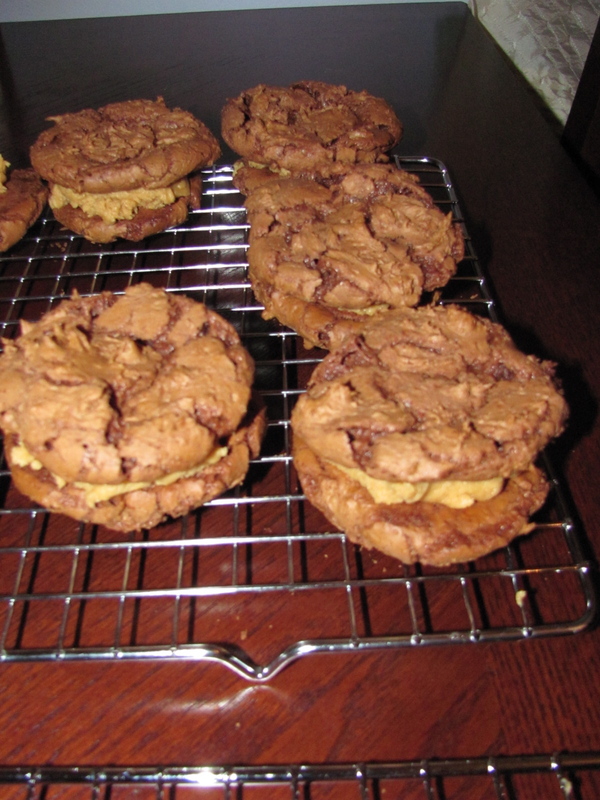 On the flat side of each of 12 cookies, spread about 1 1/2 tablespoons of the peanut butter mixture; sandwich with the remaining cookies.